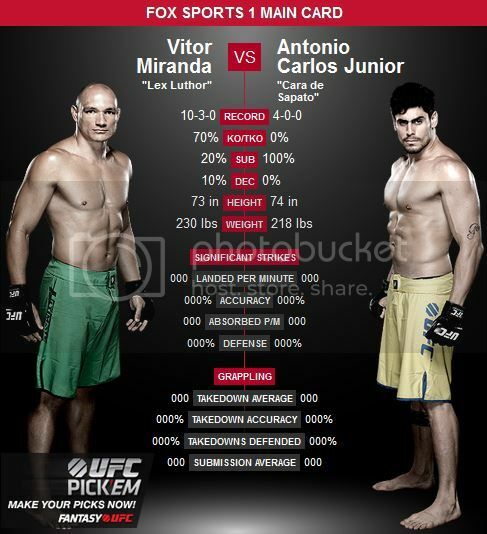 I'm picking Antonio Carlos Jr. on this one. What a terrible promo, UFC 174. Shoeface was destroying everyone on the show too quick for me to really get to see his skillset, I'm still not sure if he's that good or his opponents were just bad. Heart says Lex Luthor, head goes with Shoeface. I wanna hear Bruce Buffer say 'Cara de Sapatoooo'! Big Nog looking younger. Like 60 or something. he'd be a very small LHW too. he is 212lbs now. I was rooting for Jr until I just saw that the other guy's nickname is Lex Luthor. I gotta roll with the Lex man.